The device records up to six tracks of 24-bit/96kHz Broadcast WAV audio simultaneously, plus an additional two -12dB 'safe' backup tracks that can captured from the attachment mics or inputs. On the main body of the recorder there are four XLR/TRS combi sockets, each of which can be assigned phantom power independently of the others. What's more, each input has its own hardware level-control dial, much like those commonly found on professional location recorders, and a -20dB pad switch. The identity of the remaining two inputs depends on the attachment type. 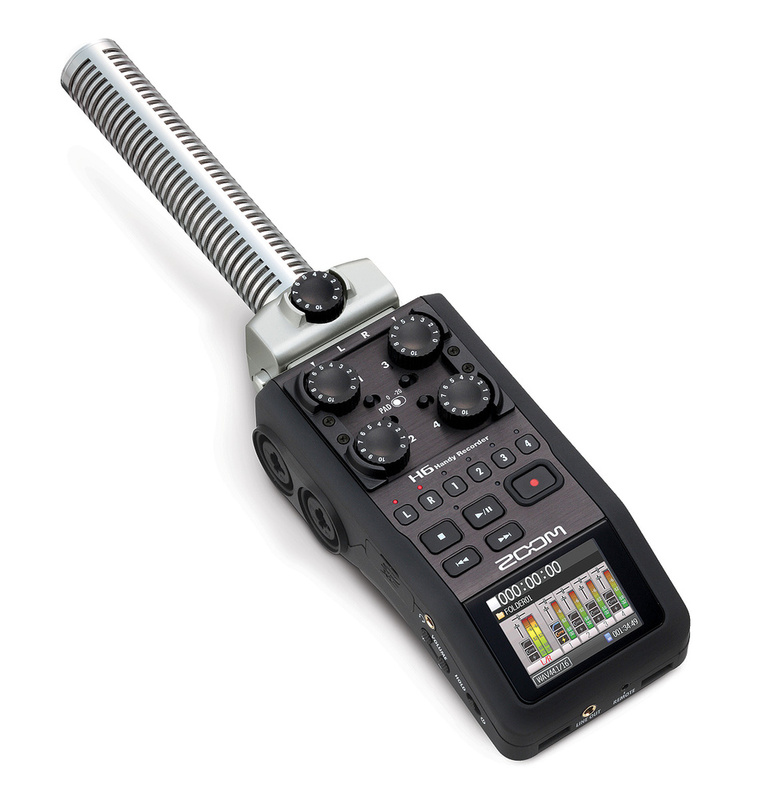 Options include X/Y, M/S and shotgun microphone systems, and a dual XLR/TRS combo attachment with a hardware level control and pad switch matching those on the main body of the recorder. The X/Y and M/S capsules are included as standard, together with a foam wind shield that fits them both, but the other two are optional extras, the shotgun being almost twice the price of the additional input module. The X/Y capsules, which can be set at either 90 or 120 degrees, are mounted on a moulded piece of metal which feels very solid and protects them from side knocks, although they are still vulnerable to front-on impacts. The block itself contains the contact board which carries the data, and the two spring-loaded clips that secure it to the body of the recorder. The M/S mic attachment, in contrast to the X/Y attachment, feels rather lightweight and flimsy, and does not look like something that will survive a knock. The section which attaches to the body of the recorder is solid enough, but the mic capsule enclosure is ball-shaped, and has a point of weakness where it meets the attachment block. Although the H6 is very capable as a recorder, it's also able to function as a digital interface, sending its audio directly to DAWs via a USB connection. When put into Multitrack mode, all six audio channels can be sent simultaneously, while the recorder provides a stereo return signal for monitoring. In this mode, any processing that has been selected is also recorded, so the user has the option of applying to any of the inputs a low cut filter of 80, 98, 115, 133 or 150 Hz, and one of three compressor and two limiter presets. As well as the X/Y array you can see in the main picture for this review, the standard package includes an M/S mic module.Central to the workings of the recorder are two mixer pages which take advantage of the colour screen. The Monitor Mixer is for managing input settings when recording to card or computer, and appears as a miniature console, showing whether or not each channel has a low-cut filter, compressor/limiter or phantom power applied. A hardware control can be used to select and modify pan and level settings within the display, but for some reason it is not possible to change the compressor, filter or phantom-power settings without exiting the mixer and delving into the menu system! The Project Mixer looks very similar to the Monitor Mixer, but is intended for processing pre-recorded material that's already in memory, and of course for mixing it down to a single stereo track. It also has pan controls across the top of each channel and vertical level faders alongside a signal level meter, but adds a box allowing the key of each individual audio track to be changed. Although colourful and clear, the screen graphics are small, so precision meter reading isn't really possible. That said, the scale favours the top 18dB, which is where the metering matters, so setting a respectable level without too much trouble should be possible. Physically, the H6 is quite chunky in comparison with some of its competitors: it is still small enough for an adult to hold in one hand, but not so small that it can really be classed as a 'pocket recorder'. The practical advantages of designing big are quite clear, though. For a start, the casing is very thick and solid, which means that the sockets for the interchangeable attachments and the four XLR/TRS inputs are held firmly in place and are very unlikely to break. There's also a threaded hole on the underside for fixing the recorder on a stand, and that too seems to be firmly embedded in the casing. The large surface area has also enabled the designers to find space on the top surface for some good-sized transport controls, plus a row of record-arming buttons for each of the six channels, collectively making it easy to perform basic recording tasks. For example, tracks inputs 1/2 and 3/4 can be paired simply by pressing and holding their track select buttons, making it possible to set up three stereo recording channels very quickly. The remaining hardware features are scattered around the edges and include the SD, SDHC and SDXC card slot, which accepts cards of up to 128GB in capacity, headphone mini-jack socket and level controls, menu-select and scroll buttons, USB, power and line out sockets, and the socket for connecting the optional remote control. On the underside is a speaker for reviewing recorded audio, plus a large battery compartment housing the four AA batteries (NiMH rechargeables can be used) that are necessary to power the colour display and supply phantom power. That may sound like quite a lot of ins and outs, but most of the settings, options and tools have been consigned to a menu system that's navigated using the scroll control. This can go up and down, obviously, but can also be pressed to make a selection. Nevertheless, heading into the menus does tend to hamper workflow when multiple changes have to be made. The menu system is, as mentioned above, where compression/limiting, low-cut filter and phantom-power assignments are made for each input, and it's a bit of a pain to have to seek them out. It does house some useful tools, though, such as a metronome, chromatic tuner and playback-speed adjustment setting, plus options such as Pre-record (which captures a few seconds of audio before the record button is pressed), and a standard Auto record mode. Most users will prefer to do their track editing in a DAW, but for those happy to get stuck in, the H6 offers normalise, trim and divide edit options, and a loop playback mode. It even allows overdubbing of up to 99 tracks per project! Once again, though, this functionality is something the user has to seek out from the menu pages. As a computer interface, the H6 is not ideal, mainly for ergonomic reasons. Once most of its inputs have connections, and its USB socket is hooked up to a computer, the recorder and its attachments form an ungainly, spidery object, with leads extending from both sides, a display at one end, and its attachment mics at the other. For my tests I mounted the recorder on a sturdy camera stand, which made it easy to move around, but getting to the screen, then to the DAW, and then back to the recording position, while avoiding the leads, sometimes proved tricky. If I was recording on location I'd certainly be inclined to invest in some high-capacity cards, rather than complicate matters further with a laptop. The mass of leads aside, though, the H6 does a decent enough job as an interface. My ageing copy of Sonar didn't like the drivers and would not record, but I had no problems using the latest version of Cockos Reaper, and I soon had all six available inputs recording directly into the software, using the stereo return signal and headphones to monitor progress. 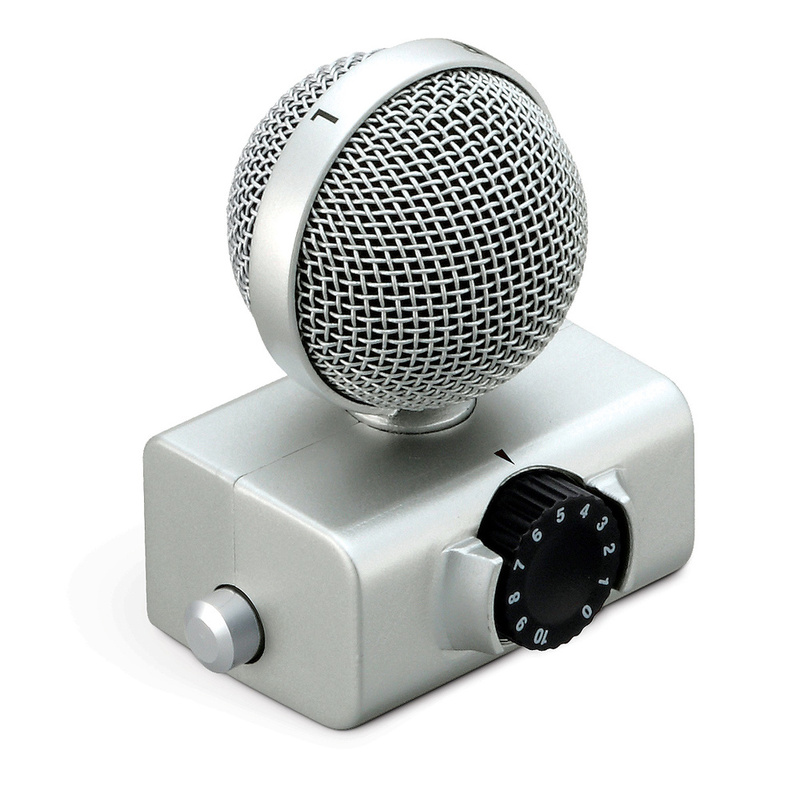 Shotgun mic and balanced mic/line-level input modules are available as cost options. Another ergonomic issue comes as the result of Zoom's decision to place the display at an angle so that the operator can see it easily. Unfortunately, this makes it almost impossible to see if seated in front of the mics, which is where self-recording artists are inevitably going to be. Their only guides are the red record indicator lights, found just above the track-arming buttons, which flash if a signal is too high. Fortunately the input level dials are quite accessible and visible from the front, (although you have to remember that anti-clockwise is a level increase in that position!) and can be moved, without reference to the on-screen metering, until the LEDs no longer flash. While on the subject of the input dials, it has to be said that they're the only feature, apart from the M/S mic, which feel a bit flimsy. Thankfully, Zoom must have thought so too, as each one is partially protected by a rim of hard plastic. The rim doesn't go all the way around, though, as that would make turning the dials impossible, and would get in the way of the four pad switches which sit between the dials. The pad switches' positioning creates another ergonomic issue, as they are too close to the level wheels, making it very difficult to move them without altering level settings! On the plus side, the designers have done a very good job of shielding the mics from handling noise. Much of the casing is coated in some sort of rubberised skin, which obviously helps, and the result is a product that is as good at rejecting handling noise as any I've tested. Nevertheless, for serious work using the attachment mics, mounting the recorder on a stand is essential. Filmmakers might be tempted to invest in the HS1 hot-shoe adapter, which enables the recorder to be mounted on the top of a camera, thereby reducing the number of tripods that are needed and ensuring that the mics are pointed in the same direction as the lens. The Zoom H4n has been a favourite amongst budget filmmakers using digital SLRs, but the H6, together with options like the SGH6 shotgun capsule, seems to be much better suited to the job. It even has built-in camera strap mounts so that an operator can wear it around his or her neck, which will suit recording engineers who need their hands free for holding boom-mic poles and adjusting headphones. Handheld recorders with built-in mics usually do a satisfactory, rather than spectacular, job of capturing audio, particularly at the lower end of the price scale. Zoom's clip-in mic arrays promise a little more quality, and it's fair to say they deliver. I connected a Neumann KM184, Audio-Technica AT4047 and two types of dynamic mics to the XLR/TRS inputs and compared their recordings with those of the X/Y array (set at both 90 and 120 degrees). Although all the mics sounded different from one another, the Zoom X/Y module did not suffer by comparison, and managed to capture low-end frequencies in a way which other handheld recorders at the budget end of the market often fail to do. Budget recorders also tend to introduce slightly higher levels of audible noise, but this too was pleasingly absent. Zoom have obviously done their research and set out to top the competition wherever they could. 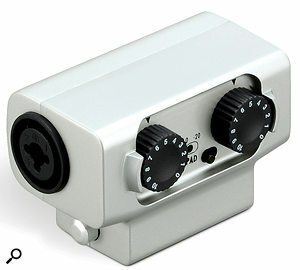 Apparently the pad switch allows input signals 30dB louder and 14dB softer than other 'Handy Recorder' products, and the preamps use higher-voltage power rails than other designs to avoid distortion. Even the diaphragms of the X/Y mics have been specifically chosen so that they are larger than those of the competition. Whatever the relative merits of these design decision might be, the H6 does a very good job and is capable of some serious recording work. The only real omission is that of a high-impedance option for when connecting electric guitar and basses — which is a little odd, given the presence of the onboard tuner and other such facilities. The M/S array's overall sound is similar to that of the X/Y, both in terms of quality and dynamic range, although, by its very nature, it is a little less tight and more expansive, and seems to handle lower frequencies more comfortably. 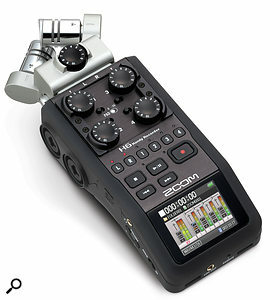 Zoom are probably going to sell a lot of H6 recorders. 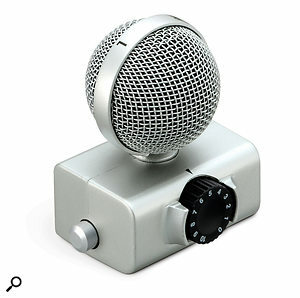 The product's ability to record multiple signals simultaneously, with independently configured phantom power, filter and dynamic settings, makes it very attractive to those recording sound for small films, documentaries and reportage, and to bands who want to record multiple instruments, or simply experiment with different microphone configurations. The recording quality is impressive for this price and, with just the few highlighted exceptions, so is the build quality. You can't please all the people all of the time, of course, and the price of the Zoom H6's versatility is paid in small frustrations that will irritate some users. The angled screen might be useful on top of a DSLR camera, but it is not helpful to artists recording themselves. The layout of the inputs, mics and screen make the H6 unwieldy as a computer interface, and setting up the mixer pages on such a small yet heavily featured device is inevitably fiddly, particularly when some settings, like phantom power assignment, are accessed only from menus. But overall, the H6 represents great value for the money, and for anyone wanting to invest in something which provides flexibility in terms of recording options, it truly stands out from the competition. Edirol's R26 is a six-channel recorder but, unlike the H6, it records three stereo pairs only. It has a touch screen for fast menu navigation, X/Y and omnidirectional microphones, plus two XLR/TRS inputs. The shotgun and extra inputs attachments (SGH6 and EHX6, respectively) were not sent for review so no comment can be made about their performance, but judging by the way the H6 intelligently adapts its internal setup to the other two attachments, they should be no trouble to mount and start using. It should be noted, however, that although the EHX6 input attachment appears to have the same features as the four on-board inputs, it does not provide phantom power. Swapping the attachments is easy and fast. Works as a 6-in, 2-out DAW interface. Four phantom-powered XLR/TRS combo inputs. Hardware controls for all basic record functions. For the most part, the construction is very solid. Good integration with DSLR cameras. Some of the most important adjustments are buried in the menu system. Pad buttons are too close to the level dials. Screen angle does not suit self-recording performers. No high-impedance input setting for guitars and basses. The H6 is capable of simultaneously recording up to six different channels of audio using a variety of microphone types and configurations. It prioritises the act of recording, providing dedicated hardware controls so that recording is fast and simple. Other settings, though, are made via a menu system, which restricts the speed at which the operator can work. The H6 also works as a 6-in, 2-out computer interface via USB. H6 recorder, including X/Y and M/S attachments £369; SGH6 shotgun mic module £119; EHX6 input module £59. All prices include VAT. Zoom UK +44 (0)1462 791100. H6 recorder, including X/Y and M/S attachments $399.99;SGH6 shotgun mic module $129.99; EHX6 input module $69.99.